One of the major functions of Nef is in the enhancement of the infectivity of the human and simian immunodeficiency viruses (HIV and SIV, respectively). However, the detailed mechanism of the enhancement of viral infectivity by Nef remains unclear. Additionally, studies of mechanisms by which Nef enhances the infectivity of SIV are not as intensive as those of HIV-1. We generated short-lived Nef constructed by fusing Nef to a proteasome-mediated protein degradation sequence to characterize the Nef role in viral infectivity. The apparent expression level of the short-lived Nef was found to be extremely lower than that of the wild-type Nef. Moreover, the expression level of the short-lived Nef increased with the treatment with a proteasome inhibitor. The infectivity of HIV-1 with the short-lived Nef was significantly lower than that with the wild-type Nef. On the other hand, the short-lived Nef enhanced the infectivity of SIVmac239, an ability observed to be interestingly equivalent to that of the wild-type Nef. The short-lived Nef was not detected in SIVmac239, but the wild-type Nef was, suggesting that the incorporation of Nef into SIVmac239 is not important for the enhancement of SIVmac239 infectivity. Altogether, the findings suggest that the mechanisms of infectivity enhancement by Nef are different between HIV-1 and SIVmac239. Lastly, we propose the following hypothesis: even when the expression level of a protein is extremely low, the protein may still be sufficiently functional. The negative regulatory factor (Nef), a 27–35-kDa non-enzymatic protein, is an accessory protein of human and simian immunodeficiency viruses (HIV and SIV, respectively) that enhances viral replication; it is associated with the pathogenesis induced by these viruses both in vivo and in vitro -. Furthermore, Nef has many functional motifs for contact to host proteins , through which it can serve as a molecular adaptor, and exert multiple functions, like the downregulation of CD4 and major histocompatibility complex (MHC) class I . N-Myristoylation occurs at the N-terminus of Nef , whose posttranslational modification is essential for its multiple functions . One of the major functions of Nef is in the enhancement of viral infectivity, which is independent of CD4  or MHC class I  downregulation. 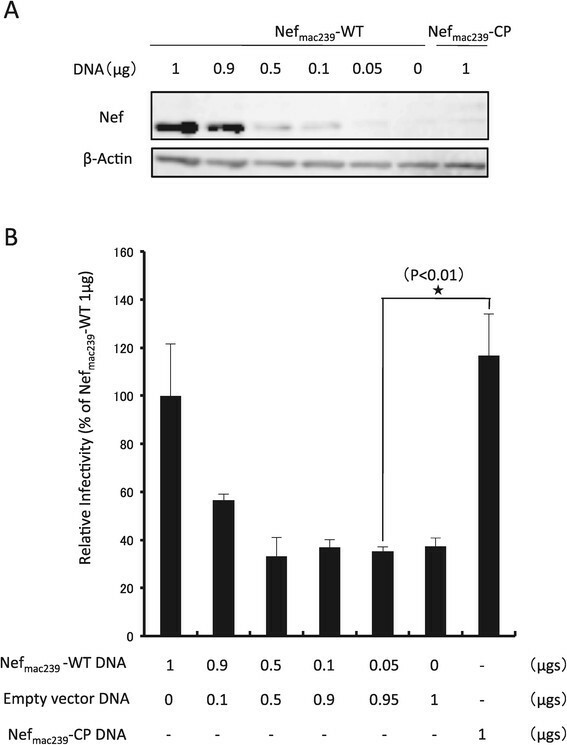 Many studies have suggested that the Nef incorporation into virions or the association of virions with Nef is responsible for the enhancement of viral infectivity mediated by Nef -. Welker et al. estimated that approximately 10 Nef molecules are incorporated into HIV-1 virions , much fewer than the 275 molecules of another accessory protein, Vpr , which also has the capability to enhance viral infectivity ,. In many reports ,-, it has been suggested that Nef incorporated into virions could exert its action in the early steps of infection, although the molecular mechanism of this phenomenon remains substantially unclear . Although Nef is clearly one of the factors for the pathogenesis induced by SIV in vivo , cell culture studies of the role of Nef in the enhancement of the infectivity of SIV  are not as intensive as those of HIV-1 described above. We, therefore, examined whether the Nef incorporation into virions or the association of virions with Nef is also important for the enhancement of the infectivity of SIVmac239 as well as of HIV-1. In this study, we generated short-lived Nef constructed by fusing Nef to a proteasome-mediated protein degradation sequence, by which the balance between the synthesis and degradation of Nef can be changed. Consequently, the apparent expression level of Nef fused to the degradation sequence becomes much lower than that of the wild-type Nef. Accordingly, the frequency of the incorporation of the short-lived Nef into vitions or the association of virions with the short-lived Nef would be lower than that with the wild-type Nef. Interestingly, the infectivity of SIVmac239 with the short-lived Nef was equivalent to that with the wild-type Nef. On the other hand, the infectivity of HIV-1NL4–3 with the short-lived Nef was significantly lower than that with the wild-type Nef. These results suggest that the mechanisms of the Nef-mediated enhancement of infectivity are different between SIV and HIV-1. Some degradation signals conferring instability on proteins have been found, which include the CL peptide  and a murine ornithine decarboxylase (MODC) PEST region . These signals induce a rapid protein degradation mediated by a proteasome, in which the CL peptide requires ubiquitination prior to degradation, whereas the PEST sequence requires no ubiqutination . The CL peptide and PEST sequence convert stable proteins into unstable ones by attachment as fusion proteins ,-, whose apparent expression levels could be much lower than those of the original proteins -. In this study, we utilized a combination of two protein degradation sequences of the CL peptide and PEST sequence, namely, the CP sequence, to generate short-lived Nef. We hypothesized that the apparent expression level of short-lived Nef is lower than that of wild-type Nef, which we evaluated to determine whether the Nef incorporation into virions is associated with the enhancement of the infectivity of SIVmac239. To detect Nef by western immunoblot analysis under the same conditions, the V5 epitope was appended at the C-terminus of Nef to preserve the N-myristoylation site of Nef, which is an essential posttranslational modification for Nef functions ,. The CP sequence was fused at the C-terminus of V5-tagged Nef (Figure 1A). Both wild-type (WT) Nef and CP-fused Nef were expressed under the control of the cytomegalovirus (CMV) promoter. To verify the effect of the fused CP sequence on Nef expression level, HEK293 cells were transfected with plasmids encoding Nefmac239-WT or Nefmac239-CP, which were from the SIVmac239 strain, and cultured for 72 h. The expression level of each Nef was evaluated by immunoblot analysis using an anti-V5 antibody. As shown in the two lanes on the left of Figure 1B, the apparent expression level of Nefmac239-CP was expectedly much lower than that of Nefmac239-WT. Uniform sample loading was confirmed by western immunoblot analysis of actin. As expected, the mobility of Nefmac239-CP was slightly but clearly lower than that of Nefmac239-WT with the fused CP sequence. To confirm that the relatively low expression of level of Nefmac239-CP is due to the introduction of the property of an extremely short life induced by proteasome-mediated degradation, treatment with the proteasome inhibitor MG132 for 6 h before the cell lysis was carried out, and Nefmac239-CP was then detected by western immunoblot analysis. As shown in the two lanes on the right of Figure 1B, the apparent expression level of Nefmac239-CP increased time-dependently about 6-fold in the cells treated with MG132 for 6 h relative to the level in the untreated cells (Figure 1C). This result validates that the relatively low expression level of Nefmac239-CP is due to its short-life property induced by fusing Nef to the CP sequence. Construction of short-lived Nef expression vector. Schematic representations of Nef-WT and Nef-CP used in this study (A). HEK293 cells were transfected with pNefmac239-WT or pNefmac239-CP. After a 48 h cultivation, HEK293 cells transfected with pNefmac239-CP were treated with 20 μM MG132 for 0 or 6 h. The cells were collected and subjected to SDS-PAGE and western immunoblot analysis to detect Nefmac239-WT and Nefmac239-CP using the anti-V5 antibody. β-Actin was also detected using the anti-β-actin antibody, as described in Materials and Methods (B). The relative band intensities of Nefmac239-CP and β-actin were quantified using Fujifilm Image Gauge software. The expression levels of Nefmac239-CP relative to those of β-actin treated with and without MG132 were calculated using the obtained intensities and compared (C). Next, we examined the incorporation level of Nefmac239-CP in the virions of SIVmac239. The nef-defective SIVmac239 provirus with the reporter gene was cotransfected into HEK293 cells with or without the plasmid encoding Nefmac239-WT or Nefmac239-CP. After a 72 h cultivation, the supernatants were collected by ultracentrifugation and used in the viral preparation, as described in Materials and Methods. The viruses were lysed and subjected to immunoblot analysis to detect Nef. Uniform virion loading was confirmed by western immunoblot analysis of the SIV p27 core antigen. As shown in the top panel of Figure 2, Nefmac239-WT was detected in SIVmac239. However, under the same conditions, Nefmac239-CP was not detected in SIVmac239, as in the mock transfection control. This result clearly indicates that the incorporation level of Nefmac239-WT is higher than that of Nefmac239-CP. Difference in incorporation level in virions between Nef mac239 -WT and Nef mac239 -CP. pBRmac239Δnef/luc was cotransfected into HEK293 cells with either pNefmac239-WT, pNefmac239-CP, or an empty vector. For virion preparation, the supernatants were subjected to ultracentrifugation. Each viral pellet was then subjected to SDS-PAGE and western immunoblot analysis to detect Nef, Env, and p27, as described in Materials and Methods. The mock sample was electrophoresed on a lane distant from two lanes of the Nefmac239-WT and Nefmac239-CP. HIV-1 Nef enhances the incorporation of the envelope protein into virions . Accordingly, we simultaneously examined the incorporation level of the envelope protein SIVmac239 virions. Western immunoblot analysis of the viral envelope protein was performed. 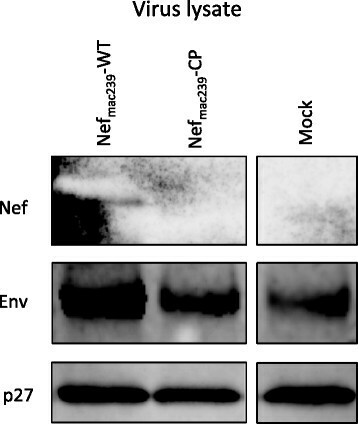 As shown in the middle panel of Figure 2, the incorporation level of the envelope protein in SIVmac239 virions with Nefmac239-CP, which was equivalent to that of the mock transfection control, was clearly lower than that with Nefmac239-WT. Altogether, the phenotype of SIVmac239 virions with Nefmac239-CP was similar to that without Nefmac239. The viral infectivity enhanced by Nefmac239-CP was compared with that enhanced by Nef mac239-WT in SIVmac239. To examine the effects of Nefmac239-WT and Nefmac239-CP on SIV infectivity, HEK293 cells were cotransfected with a nef-defective SIVmac239 provirus with the luciferase reporter gene and the plasmid expressing Nefmac239-WT or Nefmac239-CP. Additionally, plasmids expressing nonmyristoylated G2A mutants, i.e., Nefmac239-G2A and Nefmac239-CP-G2A, were also used as nonfunctional Nef. The expression level of each Nef in the virus-producing cells was examined by western immunoblot analysis of the obtained cell lysate. Indicator cells, i.e., MAGIC-5 cells, were inoculated with each supernatant containing SIVmac239, and the luciferase activity of the MAGIC-5 cells was measured after a 48 h cultivation, as described in Materials and Methods. The MAGIC-5 cell line is a HeLa cell derivative modified to express CD4 (the primary receptor) and CCR5 (the coreceptor), respectively, for the infection by SIVmac239 and CCR5-tropic HIV-1. The infectivity of each virus was compensated for by the amount of each SIV p27 antigen. The expression level of each Nefmac239 derivative in each type of producer cell is shown in the top panel of Figure 3A. Uniform sample loading was confirmed by western immunoblot analysis of actin. The expression levels of Nefmac239-CP and Nefmac239-CP-G2A were much lower than those of Nefmac239-WT and Nefmac239-G2A. Comparison of effects of Nef-WTs and Nef-CPs on enhancement of viral infectivity. pBRmac239Δnef/luc was cotransfected into HEK293 cells with either pNefmac239-WT, pNefmac239-CP, pNefmac239-G2A, pNefmac239-CP-G2A, or an empty vector (A). pBRmac239Δnef/luc was cotransfected into HEK293 cells with either pNefJR-CSF-WT, pNefJR-CSF-CP, or an empty vector (B). pNL-CHΔenv Δnef/luc and psvJR-FLenv were cotransfected into HEK293 cells with either pNefJR-CSF-WT, pNefJR-CSF-CP, or an empty vector (C). pNL-CHΔenv Δnef/luc and psvJR-FLenv were cotransfected into HEK293 cells with either pNefmac239-WT, pNefmac239-CP, or an empty vector (D). After a 72 h cultivation, the cells were collected and subjected to SDS-PAGE and western immunoblot analysis to detect Nef and β-actin, as described in Materials and Methods (top panels). The supernatants were subjected to SIV p27 or HIV-1 p24 enzyme-linked immunosorbent assay (ELISA) and infectivity assay using MAGIC-5 cells, as described in Materials and Methods (bottom panels). Each bar represents the mean standard deviation (n = 3). The comparison of the relative infectivities of SIVmac239 produced from HEK293 cells expressing all the Nefmac239 derivatives is shown in the bottom panel of Figure 3A. The enhancement of the viral infectivity by Nefmac239-WT was observed as expected whereas the enhancement of the viral infectivity by Nefmac239-G2A, a nonmyristoylated and nonfunctional mutant, was not observed. Under this condition, SIVmac239 with Nefmac239-WT was about 4-fold more infectious than the virus without Nef. Unexpectedly, the enhancement of the viral infectivity by Nefmac239-CP was observed, although the apparent expression level of Nefmac239-CP was much lower than that of Nefmac239-WT. Interestingly, no significant difference in the enhancement of viral infectivity between Nefmac239-WT and Nefmac239-CP was observed. The enhancement by Nefmac239-CP was abolished by the nonmyristoylated G2A mutation, as in the case of the G2A mutation of Nefmac239-WT. It was examined whether Nef from the HIV-1 strain can enhance SIVmac239 infectivity similarly to Nefmac239-CP. Nef from the JR-CSF strain of HIV-1, namely, NefJR-CSF, was chosen in this study because the apparent expression level of NefJR-CSF-WT is reported to be relatively higher than those of other HIV-1 strains. The top panel of Figure 3B shows the expressions of NefJR-CSF-WT and NefJR-CSF-CP in the lysate of the virus-producing cells determined by western immunoblot analysis. The apparent expression level of NefJR-CSF-CP generated by fusion of the Nef to the CP sequence was much lower than that of NefJR-CSF-WT, and the mobility of the weakly expressed NefJR-CSF-CP was lower than that of NefJR-CSF-WT as in the case of Nefmac239-CP (Figure 1B). Under this condition of the virus-producing cells, the infectivity of each produced SIVmac239 with or without NefJR-CSF-WT or NefJR-CSF-CP was examined. As shown in the bottom panel of Figure 3B, significant enhancement of the viral infectivity by NefJR-CSF-WT and NefJR-CSF-CP in comparison with that in the case of a virus without Nef was observed. Moreover, no significant difference in the enhancement of viral infectivity between NefJR-CSF-WT and NefJR-CSF-CP was observed, as in the case of Nefmac239-WT and Nefmac239-CP. Altogether, these results indicate that Nef-WTs and Nef-CPs show equivalent activities for the enhancement of SIVmac239 infectivity in the case of Nef from not only SIVmac239 but also HIV-1, even though the apparent expression levels were markedly different between Nef-WTs and Nef-CPs. Many studies have suggested that the Nef incorporation into virions or the association of virions with Nef is responsible for the enhancement of the infectivity of HIV-1 -,. Accordingly, it has been expected that the activity of Nef-CPs would be lower than that of Nef-WTs in HIV-1. The effects of Nef-WTs and Nef-CPs on HIV-1 infectivity were evaluated as follows. HEK293 cells were cotransfected with an env- and nef-defective HIV-1NL4–3 provirus with the luciferase reporter gene inserted into nef, a plasmid encoding a CCR5-tropic JR-FL envelope protein, and a plasmid encoding either NefJR-CSF-WT, NefJR-CSF-CP, Nefmac239-WT, or Nefmac239-CP. To examine the infectivity, MAGIC-5 cells were infected with the supernatants including CCR5-tropic HIV-1NL4–3 and incubated for 48 h. Then, luciferase activity as the indicator of infectivity was measured. The infectivity of each virus was compensated for by the amount of the p24 antigen of each virus. The top panel of Figure 3C shows the expressions of NefJR-CSF-WT and NefJR-CSF-CP in the virus-producing HEK293 cells determined by western immunoblot analysis. Uniform sample loading was confirmed by western immunoblot analysis of actin. As expected, the expression level of NefJR-CSF-CP was much lower than that of NefJR-CSF-WT, whose expression profile was the same as that of NefJR-CSF-WT or NefJR-CSF-CP expressed in SIVmac239-producing cells (Figure 3B). Under this condition of the virus-producing cells, the infectivity of HIV-1NL4–3 with NefJR-CSF-WT was significantly much higher than that of HIV-1NL4–3 without Nef. On the other hand, the infectivity of HIV-1NL4–3 with NefJR-CSF-CP was significantly lower than that of HIV-1NL4–3 with NefJR-CSF-WT, which correlated with the expression levels of NefJR-CSF-WT and NefJR-CSF-CP. Next, it was examined whether Nefmac239-CP enhances HIV-1NL4–3 infectivity. The top panel of Figure 3D shows the expression profiles of Nefmac239-WT and Nefmac239-CP in the lysate of the virus-producing cells by western immunoblot analysis. Uniform sample loading was confirmed by western immunoblot analysis of actin. The expression level of Nefmac239-CP was found to be much lower than that of Nefmac239-WT, showing the same expression profile as that of each Nefmac239 derivative expressed in the SIVmac239-producing cells (Figure 3A). Under this condition of the virus-producing cells, the infectivity of HIV-1NL4–3 with Nefmac239-WT was significantly much higher than that of HIV-1NL4–3 without Nef. On the other hand, the infectivity of HIV-1NL4–3 with Nefmac239-CP was significantly lower than that of HIV-1NL4–3 with Nefmac239-WT, which correlated with the expression levels of Nefmac239-WT and Nefmac239-CP. Taken together, the above results indicate that the activity of enhancement of HIV-1 infectivity by Nef-CPs is significantly lower than that by Nef-WTs, which were from both SIVmac239 and HIV-1JR-CSF. The difference in this activity between Nef-CPs and Nef-WTs was considered to be associated with the difference in apparent expression level between Nef-CPs and Nef-WTs. These results for HIV-1 could support previous reports suggesting that the Nef incorporation into virions or the association of virions with Nef is responsible for the enhancement of the infectivity of HIV-1 -,. Therefore, the substantial enhancement of infectivity of SIVmac239 by Nef-CP is again considered to be a unique property. It was indicated that Nef-CPs could enhance the infectivity of SIVmac239, whose apparent activity was equivalent to those of Nef-WTs, although the apparent expression levels of Nef-CPs were much lower than those of Nef-WTs (Figures 3A and B). Typically, the activities of Nef-CPs are lower than those of Nef-WTs for the enhancement of SIVmac239 infectivity, similarly to HIV-1 (Figures 3C and D). However, the profiles of the activities of Nef-WTs and Nef-CPs for SIVmac239 were unexpectedly but interestingly different from those for HIV-1. Here, we hypothesized that even a very low expression level of Nef is sufficient to enhance the infectivity of SIVmac239. To test this hypothesis, a plasmid DNA encoding for Nefmac239-WT was diluted to 1, 0.9, 0.5, 0.1, 0.05, and 0 μg, to which mock empty plasmid DNA was added to a total 1 μg. HEK293 cells were cotransfected with 1 μg of a plasmid DNA mixture containing the indicated Nefmac239-WT-encoding DNA and 1 μg of the nef-defective SIVmac239 provirus with the reporter gene. Moreover, HEK239 cells were cotransfected with 1 μg of plasmid DNA encoding for Nefmac239-CP and 1 μg of the nef-defective SIVmac239 provirus with the reporter gene for comparison of the effect on infectivity between Nefmac239-WT from DNA of various amounts and Nef mac239-CP from 1 μg of DNA. At 72 h posttransfection and cultivation, the virus-producing cells were lysed and subjected to western immunoblot analysis to detect Nefmac239-WT and Nefmac239-CP. At the same time, the supernatants were evaluated for viral infectivity, as described above. As shown in Figure 4A, a graded decrease in the expression level of Nefmac239-WT was observed in a Nefmac239-WT encoding DNA dose-dependent manner. A very low expression level of Nefmac239-CP from 1 μg of DNA was observed, which was much lower than that of Nefmac239-WT from 1 μg of DNA and was almost equivalent to that of Nefmac239-WT from 0.05 μg of DNA. Under this condition of each virus-producing cell type, the infectivity of each SIVmac239 produced is shown in Figure 4B. A graded decrease in infectivity of the virus was observed in a transfected Nefmac239-WT encoding DNA dose-dependent manner. The infectivity of SIVmac239 produced from the cells transfected with 0.05 μg of DNA encoding Nefmac239-WT was significantly lower than that transfected with 1 μg of DNA encoding Nefmac239-CP. On the other hand, the infectivity of SIVmac239 produced by cells transfected with 1 μg of DNA encoding Nefmac239-WT was almost similar to that transfected with 1 μg of DNA encoding Nefmac239-CP, whose result was the same as that shown in Figure 3A. Taken together, these results indicate that such a low expression level of Nefmac239-WT, which is similar to that of Nefmac239-CP, is not sufficient to enhance the infectivity of SIVmac239. Effect of low expression level of Nef mac239 on SIV mac239 infectivity. pBRmac239Δnef/luc was cotransfected into HEK293 cells with 1 μg of a mixture of pNefmac239-WT and an empty vector, at amounts of pNefmac239-WT in grams indicated. After a 72 h cultivation, the cells were collected and subjected to SDS-PAGE and western immunoblot analysis to detect Nef and β-actin, as described in Materials and Methods (A). The supernatants were subjected to SIV p27 ELISA and infectivity assay using MAGIC-5 cells as described in Materials and Methods (B). Each bar represents the mean standard deviation (n = 3). Although the enhancement of viral infectivity by Nef is clear, the molecular mechanism by which Nef enhances the infectivity of HIV-1 and SIV remains unclear. In this study, it was clearly indicated that there is a significant difference between SIVmac239 and HIV-1NL4–3 in their response to the infectivity enhancement by Nef-CP, suggesting that the molecular mechanisms of Nef action differ between SIVmac239 and HIV-1NL4–3. It has been reported that HIV-1 Nef enhances the incorporation of envelope proteins into virions, which is associated with the increase in HIV-1 infectivity . Additionally, Nef incorporated into virions is suggested to directly enhance virion infectivity in the early steps of infection by HIV-1 ,. In this study, it was observed that the amount of envelope protein of SIVmac239 without Nefmac239-WT was clearly lower than that with Nefmac239-WT, suggesting that Nefmac239 can also enhance the incorporation of envelope proteins into SIVmac239 as in the case of HIV-1 . Thus, the amount of envelope protein of SIVmac239 with Nefmac239-CP was clearly lower than that with Nefmac239-WT, which was similar to that without Nefmac239-WT (Figure 2). On the other hand, the infectivity of SIVmac239 with Nefmac239-CP was interestingly equivalent to that with Nefmac239-WT (Figure 3A). Accordingly, it is suggested that the enhancement of the incorporation of the envelope protein into SIVmac239 by Nefmac239 is not associated with the enhancement of viral infectivity by Nefmac239. Additionally, the direct action of Nef incorporated to virions in the early step of SIVmac239 infection is suggested to be not essential for the enhancement of viral infectivity. Taken together, the results suggest that the molecular mechanisms of the Nef-mediated enhancement of viral infectivity are different between HIV-1 and SIVmac239. Furthermore, a mechanism by which Nefmac239 can enhance SIVmac239 infectivity inside virus-producing cells, which is not associated with the incorporation of envelope proteins into the virions, may exist. The N-myristoylation of Nef is essential for the major functions of Nef . 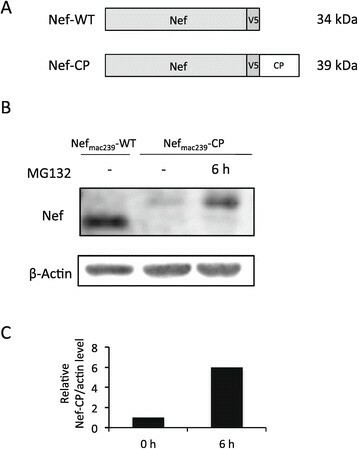 The lack of effect of nonmyristoylated Nefmac239-CP-G2A on the enhancement of viral infectivity (Figure 3A) indicates that the function of Nefmac239-CP is also dependent on N-myristoylation and may be dependent on membrane localization. Since it was also confirmed that such a low expression level of Nefmac239-WT from 0.05 μg of DNA, similar to that of Nefmac239-CP from 1 μg of DNA, was not sufficient to enhance the infectivity of SIVmac239 (Figure 4), it is hypothesized that a protein synthesis process for producing a quorum of Nefmac239 molecules within a short time in SIVmac239-producing cells is required for the enhancement of viral infectivity even if the duration of the presence of each molecule of Nefmac239 is extremely short in the cell. Lastly, we propose the following hypothesis: even when the expression level of a protein such as Nef-CP is extremely low, the protein may still be sufficiently functional; this novel and unique hypothesis might be greatly applicable in various fields such as biochemistry and cell biology. Thus, a rapid turnover by not only rapid protein degradation but also efficient production of a protein through a strong promoter activity in transcription or efficient translation might be essential for the protein to function sufficiently. The findings suggest that the mechanisms of the enhancement of viral infectivity by Nef are different between HIV-1 and SIVmac239. Additionally, we propose the following hypothesis: even when the expression level of a protein is extremely low, the protein may still be sufficiently functional. The infectious HIV-1NL4–3 expression vectors pNL-CH  and psvJR-FLenv  were kindly gifted by Dr. Ron Swanstrom of the UNC Center for AIDS Research, University of North Carolina at Chapel Hill, Chapel Hill, NC. The infectious HIV-1 expression vector pYK-JRCSF was obtained from the NIH AIDS reagent program. Firefly-luciferase-encoding DNA was amplified by PCR using a pGL4.14 [luc2/Hygro] vector (Promega, Madison, Wi) and inserted into the nef-coding region of pBRmac239, coding for SIVmac239 proviral DNA, as previously reported . The nef-deficient and luciferase-gene-inserted SIVmac239 proviral DNA vector was named pBRmac239Δnef/luc. To delete env of pNL-CH, the Stu I and BsaB I sites in env were digested by the corresponding enzymes and the linear DNA obtained was subjected to a ligation reaction, whose vector encoding the env-deficient proviral DNA was named pNL-CHΔenv. Firefly-luciferase-encoding DNA was amplified in PCR using a pGL4.14 [luc2/Hygro] vector and inserted into the nef-coding region using the Xho I site of pNL-CHΔenv, whose vector with the luciferase reporter gene and without env and nef was named pNL-CHΔenv Δnef/luc. Nef-coding DNAs were amplified by PCR using the corresponding proviral DNA templates (pBRmac239 for Nefmac239 and pYK-JRCSF for NefJR-CSF) and subcloned into pcDNA3.1D/V5-His TOPO according to the manufacturer’s instructions (Invitrogen, Carlsbad, CA). A Gly2-to-Ala2 (G2A) mutation in nef was introduced using site-directed mutagenesis. To introduce the short-life property into the expressed Nef proteins, DNA encoding a sequence of the CL peptide and the PEST, namely, the CP sequence, was amplified from pGL4.78 [hRlucCP] Hygro (Promega, Madison, Wi). The DNA was then linked after the region of the V5 epitope tag encoding DNA using the Age I site of each Nef expression vector. All the constructed Nef expression vectors were named as follows: pNefmac239-WT, pNefmac239-CP, pNefmac239-G2A, pNefmac239-CP-G2A, pNefJR-CSF-WT, and pNefJR-CSF-CP. For the preparation of SIVmac239, pBRmac239Δnef/luc was transiently cotransfected with either pNefmac239-WT, pNefmac239-CP, pNefmac239-G2A, pNefmac239-CP-G2A, pNefJR-CSF-WT, pNefJR-CSF-CP, or an empty vector into HEK293 cells using Lipofectamine LTX reagent (Invitrogen, Carlsbad, CA). For the preparation of CCR5 tropic HIV-1NL4–3, pNL-CHΔenv Δnef/luc and psvJR-FLenv were transiently cotransfected with either pNefmac239-WT, pNefmac239-CP, pNefJR-CSF-WT, pNefJR-CSF-CP, or an empty vector into HEK293 cells. At 72 h posttransfection, the supernatants were collected and filtered through a 0.45 μm filter and subjected to ELISA for p27 or p24 antigen or viral infectivity assay. For virion preparation, the supernatants were subjected to ultracentrifugation as previously described . Each cell-free supernatant was filtered using a 0.45-μm-pore-size filter and subjected to ELISA for SIV p27 or HIV p24 (ZeptoMetrix Corporation, Buffalo, NY), according to the manufacturer’s instructions. MAGIC-5 cells were inoculated with the supernatant as previously described . After a 72 h cultivation, the cells were washed with PBS(−) and lysed with Cell Culture Lysis Reagent (Promega, Madison, WI). The luminescence of the firefly luciferase reporter was measured with a luciferase assay system (Promega, Madison, Wi) using a Wallac ARVO™ SX 1420 luminometer (Perkin-Elmer, Waltman, MA). The cells were washed, lysed, and subjected to 5–20% polyacrylamide gradient sodium dodecyl sulfate-polyacrylamide gel electrophoresis (SDS-PAGE) and western blot analysis. The antibodies used in different immunoblottings were as follows: anti-V5 antibody (Invitrogen, Carlsbad, CA), anti-actin antibody (Oncogene, San Diego, CA), anti-gp130 SIV monoclonal antibody (Immuno Diagnostics, Inc., Woburn, MA), and anti-SIVmac239 monkey serum. Immunocomplexes were detected using appropriate peroxidase-conjugated secondary antibodies, followed by visualization by chemiluminescence detection (NEN Life Science Products, Boston, MA, USA) with LAS4000 (GE Healthcare, Buckingham, England). The intensities of the bands were quantified with Fujifilm Image Gauge Software. This study was supported in part by Grants-in-Aid for Scientific Research (B) and (C) from the Ministry of Education, Culture, Sports, Science and Technology of Japan, a Health and Labour Sciences Research Grant from the Ministry of Health, Labour and Welfare of Japan. KH performed most of the experiments. NT designed the experiments and participated in the experiments. NT and KH wrote the manuscript. SS and SM supervised the project. All authors are read and approved the final manuscript.